This walkthrough demonstrates how to write a simple web application that connects to Microsoft Dynamics CRM 2015 and performs a basic create contact transaction. You can find the sample code that this walkthrough produces in the Sdk\Walkthroughs\Portal\WebAppWalkthrough folder. Run the CrmSvcUtil.exe tool, with the Microsoft.Xrm.Client.CodeGeneration extension, to generate your entity classes and service contexts. The following example command creates a file called “Xrm.cs” that points at an instance of Microsoft Dynamics CRM. Note that the Microsoft.Xrm.Client.CodeGeneration.dll file must be in the same directory as the CrmSvcUtil.exe file, or in the system global assembly cache, when you run this command. The first command shown here is for an on-premises organization while the second command is for a CRM Online organization. Both commands should be executed as a single command line with no line breaks. The CrmSvcUtil tool is available in the Bin folder of the SDK download or by installing the Microsoft.CrmSdk.CoreTools NuGet package. 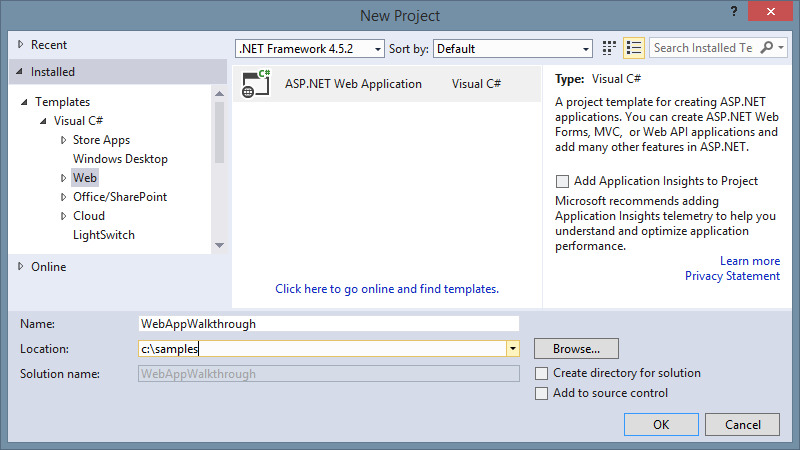 Create a new ASP.NET web application project in Microsoft Visual Studio. This sample uses “WebAppWalkthrough” as the project name. Add the following references from the SDK\bin folder. You can skip this step and the next by simply installing the Microsoft.CrmSdk.Extensions NuGet package. Add the following references from .NET. Right-click the project in Visual Studio, click Add, and then click Existing Item. Select the “xrm.cs” file that you created when you generated the early bound types. Edit the web.config file to register the <microsoft.xrm.client> section. You’ll need to add a section into the configSections node of the configuration as shown here. Edit the web.config file with your specific connection string and context. For the connection string, set the name to “Xrm”. In the <microsoft.xrm.client> section add a context with the name “Xrm” and set the type to the namespace and service context name you provided in Step 1 when you set up the web application project. In the following example it is Xrm.XrmServiceContext and the assembly part of the type is the name of your web application, “WebAppWalkthrough”. Add the following to the <controls> section of the web.config file to register the Microsoft.Xrm.Portal controls with this Web application. Create a basic webpage that displays all contacts in your CRM system in an ASP.NET data grid. Right-click your project and add a new web form called “WebForm_LinqDataSource.aspx”. 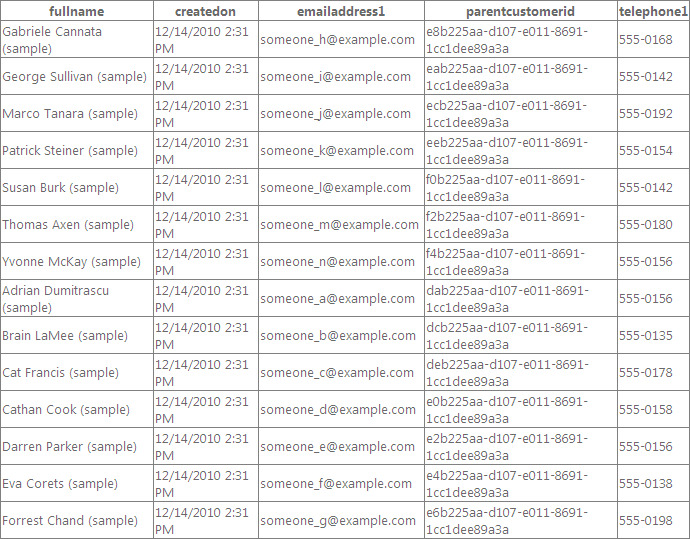 Create a webpage that displays contacts in your CRM system in an ASP.NET data grid based on a CRM view definition. Right-click your project and add a new web form called “WebForm_SavedQueryDataSource.aspx”. Add the following to the new aspx page. 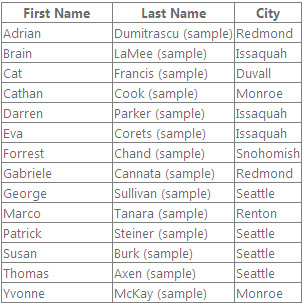 Create a WCF Data Service for Microsoft Dynamics CRM. In CRM, go to Settings, Customizations, and Customize the System. 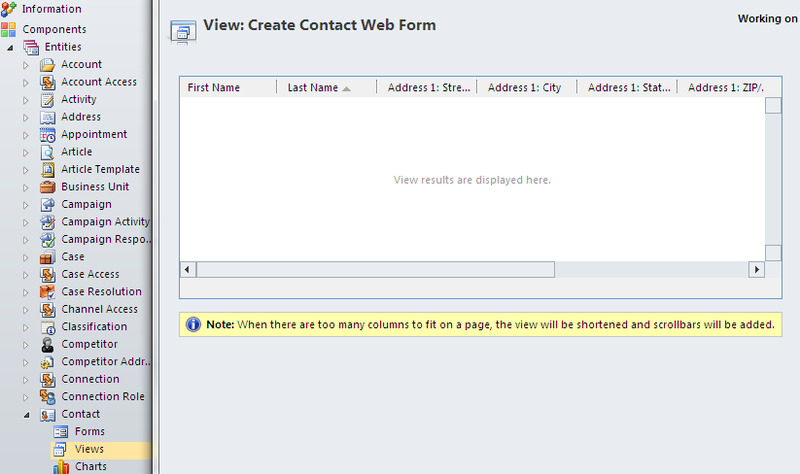 Create a new view for the contact entity called “Create Contact Webform”. 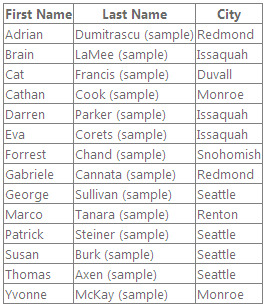 Add columns to the view that you want to have appear as fields in the generated form. 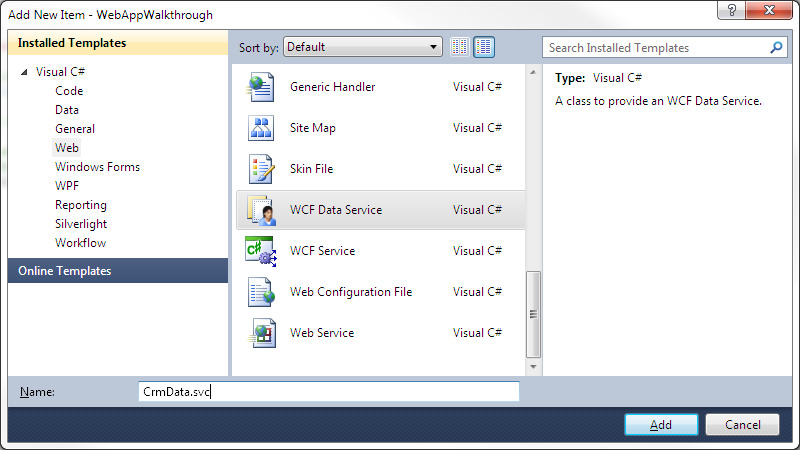 Right-click your web project in Microsoft Visual Studio and add a new web form called “WebForm_FromSavedQuery.aspx”. Create a webpage that uses code behind to connect a Microsoft Dynamics CRM data source to an ASP.NET GridView control. Right-click your project and add a new webpage called “WebForm_CodeBehindDataSource.aspx”. Add the following code to the new aspx page.